I don't consider myself a backward-looking person by nature but I've always been fascinated with 20th Century American pop culture. Ever since I was a kid I've been curious about painters and musicians, actors, playwrights and athletes. It started as a way to connect with my father and his family. Their tastes and cultural heroes were firmly rooted in the 1920s through the '50s. So as a teenager I was more familiar with S.J. Perelman than I was with, say, Dave Barry. But if my curiosity began as a way to have a conversation with my relatives it soon developed into something more private. When the Regency movie theater on the Upper West Side played a revival of Charlie Chaplin, Buster Keaton and Woody Allen in 1986, I went and was hooked on Buster, just hooked. I found James Agee's seminal essay on silent movie comedy—where he referred to Keaton's "mulish imperturbability"—and fell in love with Agee's movie reviews. I'd read an interview with Keith Richards or Eric Clapton, learn about Robert Johnson, Howlin' Wolf, and Muddy Waters, then go to Tower Records or King Carroll's and bought albums by the masters. Later still, I'd read the liner notes of rap records, figure out who was being sampled and go back and get albums by James Brown, Lou Donaldson, and Cal Tjader. In the fall of 2002, I started Bronx Banter, ostensibly to write about rooting for the Yankees, but really it was to practice writing. I'd had a load of baseball books as a kid but hadn't been interested in them for years. Now, I caught up, reading everything I could get my hands on. 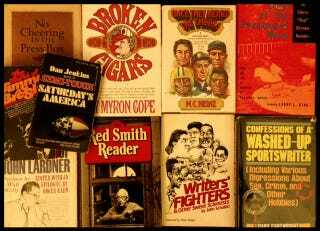 Along the way, I was introduced to the work of some of the great newspaper and magazine writers of our time. Eventually, I got to know several of them personally, too. Men like Pat Jordan and John Schulian, Peter Richmond and Mark Kram, John Ed Bradley and Bill Nack, Richard Ben Cramer and Pete Dexter. I ran long interviews on the blog with some of them on The Banter, exchanged e-mails and phone calls with others, and most importantly, read their work. Glenn Stout and Schulian, in particular, turned me on to writers I'd never heard of before. And I found that most of these writers had a custodian feeling about the craft of storytelling. I was an engaged student and they were more than happy to pass along some wisdom. I'm no expert just an enthusiast—okay, a nerd. I've hit the microfilm room at the New York Public Library and battled the antiquated machinery on the quest to track down old stories (just like my record head friends used to dig for vinyl), dozens of times. Just cause. I'd find what I was looking for—or not—and also happen upon things I'd never heard of either. Buried in the microfilm. So when The Banter celebrated its tenth anniversary last fall I thought it'd be cool to reprint a handful of memorable non-fiction. I selected a few pieces and got permission to run them. Then I got greedy and I thought of more pieces. To my delight, I continued to get the okay from writers or from their families to reprint them. The point is simple: find classic pieces of writing that can't be found on-line and give them a home. Introduce them to a new audience or present them to readers who haven't read them in years. That's what I'll offer in this space, a simulcast of what's being reprinted in this Banter series. This off-shoot site is intended to be a living archive, so there will be material that is reprinted for the first time on-line but also, I'll provide plenty of posts with links to worthy material that's already on-line but that you may have missed. It won't all be sports, it won't all be links to articles. Sometimes it will be interviews or author profiles. Most of all it'll be fun. If there are any stories that you'd like to see included, pieces that you can't find, shoot me an e-mail and let me know. I'll be more than happy to try and dig it up. Let's start it off with this 2005 story by Pat Jordan on Efren Reyes. Published in The Atlantic, here's "The Magician."